Matt Balazik catches a sturgeon in a net. Photo credit: Jamie Brunkow. The one advantage is this research area was pretty much my backyard growing up; so I knew the water very well already. 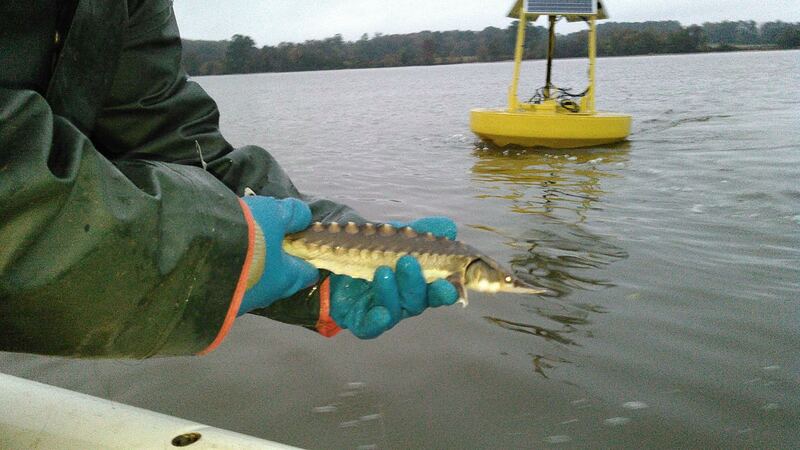 Along with other scientists working at the Rice River Center, Balazik has been tagging and monitoring the movements of sturgeon in the James River for ten years. 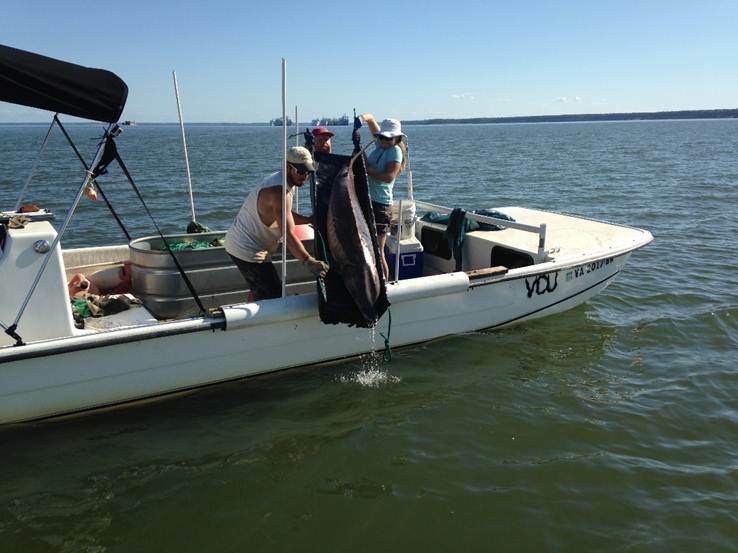 He and other scientists from Virginia Commonwealth University use large nets to catch the sturgeon, tag them and release them to their native waters. With a global satellite receiver, they record the pings from the acoustic tags inserted in the fish and track their migration. 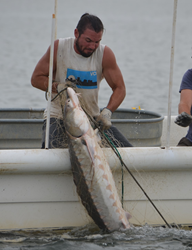 Since 2009, Balazik and his team have tagged 782 sturgeon. Rice Rivers Center personnel and other members of the Virginia Sturgeon Restoration Team have built a 300-foot-long artificial sturgeon reef near the Presquile National Wildlife Refuge on the James River near Hopewell. Visitors must obtain a pre-arranged permit to visit the island. The National Wildlife Refuge will sponsor a public field day on September 22. According to National Oceanic and Atmospheric Administration (NOAA), Atlantic sturgeon live in rivers and coastal waters along the East Coast. They can live up to 60 years, weigh up to 800 pounds and reach up to 14 feet in length. As juveniles, the fish swim from coastal rivers like the James into the ocean, but they return to their birthplace to spawn in the spring and fall. Dating back perhaps 100 million years, sturgeon have changed little since prehistoric times. The armor-plated fish have five rows of external bony plates called scutes, a tail like a shark and a long hard head with four sensory barbels, or fleshy filaments, hanging from its snout. Atlantic sturgeon were the mainstay of Jamestown colonists in the early 1600s, but by the late 1800s, the fish became nearly extinct. Overfishing, ecological changes and pollution led to the decline of the sturgeon. Virginia may have been the first state to declare a moratorium on fishing for sturgeon in 1974. In 2012 NOAA declared the Atlantic sturgeon an endangered species and fishing for sturgeon or its eggs (caviar) is illegal in the United States. Visitors may connect with the VCU Rice Rivers Center by attending an open house. Visitors are welcome during the Rice Center open houses on the second Thursday of every month, from 1 to 4 p.m. Call 804- 827-5600 or email ricerivers@vcu.edu for more information. Visitors who are interested in other environmental preservation projects and outdoor recreation should contact the Hopewell and Prince George, VA, tourism office : 1-800-863-8687. Tourism advisors at the center can provide details on area accommodations, itineraries, outdoor adventure, water sports, food, musical performances and entertainment in and around Hopewell and Prince George, Virginia. Hopewell/Prince George, Virginia, is located 20 miles south of Richmond, Virginia, situated on 35 miles of historic riverfront on the Appomattox and James Rivers. Hopewell-Prince George is just off Interstate 295 between Richmond and Williamsburg and has major transportation arteries running through it – Route 10, Route 460, and I-85. Matt Balazik with the first fall adult captured upstream. Photo credit: Charles Frederickson. Matt Balazik and his team release a big female sturgeon into the river. Photo credit: Jamie Brunkow. Matt Balazik with a small sturgeon.